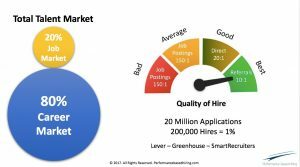 Based on reports from different applicant tracking systems, it took 20 million job applications to hire 200 thousand people. That’s one in one hundred or 1%. For those who applied directly it was much worse, about one hire for every 160 applications. It was much better if a recruiter contacted you via LinkedIn or found your resume. In this case the chance of getting hired was 20 to one. The best odds for getting a job was via a referral. In this case your chances were about 10 to one. While the odds clearly favor being found (aka, direct sourced) or being referred, there’s much more to the story. In these cases, the jobs were much better, too. The reason is obvious: When a company contacts you about an opportunity, the job being offered needs to be better than the one you already have or else you wouldn’t be interested. In this case the company is the seller and you’re the buyer. And the buyer always has an advantage. As important, the on-the-job performance of the people hired via the direct sourced and referral process is superior to those hired via the application process. This reason is obvious, too. There is more time spent ensuring there is strong fit between the company and the candidate. When you apply directly, the job is ill-defined, the selection criteria is typically a laundry list of “must have” skills and experiences, and the compensation is negotiated as the criteria for having a conversation. Worse, to even get to the compensation discussion you must jump through a bunch of hoops to validate your skills and experiences. Sadly, candidates will do this to meet some low order Maslow need (i.e., basic economic well-being). Under these conditions the likelihood of the job being a great career move is problematic. In this case the company is the buyer and the candidate is the seller. And the buyer always has the advantage, especially when the demand for their product (the open job) is greater then the supply (150-200 applicants for every opening). Yet this advantage is wasted by the company by not focusing on criteria that best predicts fit and performance. But you get what you pay for. This is what happens when companies allow everybody to apply to their job openings without any effort. Recognize that acquaintances get better jobs than strangers. People who are promoted internally or re-hired by a former co-worker are judged on their past performance. Strangers are judged on their depth of skills, experiences and interviewing ability. Being personally known to someone at your target company is best, but getting referred is almost as good. These “weak connections” allow you to bypass the hurdles associated with strangers. Get referred. The real value of LinkedIn is that it’s a structured network of 500+ million people, not just a database of these names. Use this to your advantage. Networking is not about meeting as many people as possible. It’s about connecting with a few people who can vouch for your ability to others. To leverage LinkedIn, spend more time building a network of people who know you, and then ask them to refer you to others in their network who might have open opportunities. Think process, not event. Getting a better job is a series of steps, not a one-time interview. Once you get referred to someone, don’t try to sell yourself into a job. Instead, ask about their challenges and problems. Only then offer yourself as a possible solution. This could be a short project rather than a full-time job, so suggest this if it’s a possibility. Go through the back door. Even if you find a job of interest on some job board, do not apply directly. Instead find someone at the company who can refer you. Often this can be alumni from your university or someone in one of your professional groups. As you reach out to these people, don’t just send a resume. Instead, describe a project you’ve handled that best compares to some likely key aspect of the job. Then suggest a short meeting to discuss the idea. Become the buyer. It’s obvious that you have the buyer’s advantage if someone comes after you rather than you pursuing them. One way to improve your positioning is to ensure your LinkedIn profile mentions every award and honor you’ve ever received. Recruiters search on these terms. Also describe a least one major accomplishment at each job you’ve had. During the initial meeting you can leverage your accomplishments by asking the interviewer to describe some of their challenges. Then describe an accomplishment that’s most comparable. Rather than wasting your time applying to every job available and hoping for the best, it’s best to stop hoping. Instead, find jobs and companies that meet your career needs and then work like heck trying to make some acquaintances there. It won’t take any more time, and more important, this is time well spent. Lou Adler (@LouA) is the CEO of The Adler Group, a consulting and training firm helping companies implement Performance-based Hiring. He’s also a regular columnist for Inc. Magazine, SHRM and BusinessInsider. His new Performance-based Hiring micro-course is now available on Lynda.com. His latest book, The Essential Guide for Hiring & Getting Hired (Workbench, 2013) is now being published in Korea and Japan. It provides hands-on advice for job-seekers, hiring managers and recruiters on how to find the best job and hire the best people.